Rene Croteau could speak fluent French. It was going to be a big help when he parachuted into Normandy but, instead, it lead to a terrible tragedy. Rene A. "Punchy" Croteau, the son of Edward and Rose Croteau, was a pre-war paper mill worker and semi-pro ballplayer from Holyoke, Massachusetts. He was born in 1916 and entered military service on November 28, 1942. Private First-Class Croteau served with the 508th Parachute Infantry Regiment of the 82nd Airborne Division and was stationed in England in 1944 in preparation for D-Day. On Sunday, May 28, 1944, Croteau played his last ball game before an enthusiastic crowd of 7,000 fans gathered at Meadow Lane soccer ground in Nottingham, England. The 508th Red Devils played an exhibition game against the locally based 505th PIR Panthers. The Panthers were no match for the Red Devils, losing 18-0. On June 6, 1944, Croteau was among 24,000 Allied paratroopers who ascended through the darkness into the chaos and confusion of Normandy. Unlike some of his Red Devils' teammates, Croteau survived D-Day and was involved in the constant skirmishes with German defending troops that followed. Rene Croteau was fluent in French and quickly became friends with a young French boy of about 15. Piece by piece the young French boy had acquired and 82nd Airborne uniform and boots and tagged along with his new buddies. As I Company were advancing across open terrain on Hill 95 overlooking La Haye-du-Puits on July 4 1944, with Pfc. Croteau on point, a German machine gun opened fire. Private First-Class Croteau was killed instantly. Oblivious to the fact that Croteau was already dead, the French boy ran out into the field and tried to drag his friend to safety. The German machine gun opened fire again and seconds later the bullet-riddled, lifeless body of the young French boy lay beside that of his dead American friend. 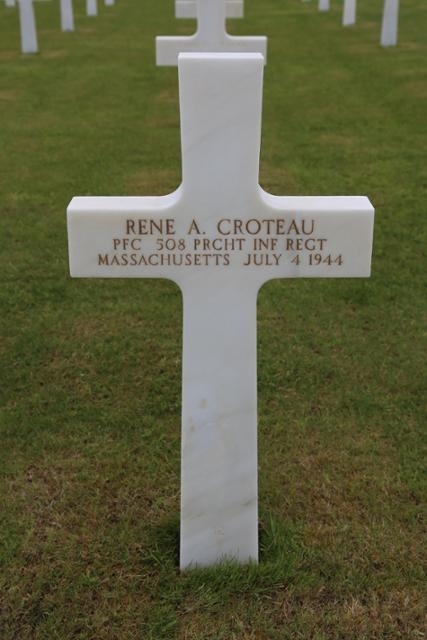 Rene Croteau is buried at the American Military Cemetery in Normandy, France.